Editor’s note: Daniel Glick and Ted Wood of The Story Group, along with Kelsey Ray of The Colorado Independent, have been reporting on oil and gas issues for our ongoing series: Fractured. Fractured examines the science, politics and humanity of oil and gas development and explores its impacts on Coloradans around the state. Advocates for tighter controls on the oil and gas industry who have appeared at Colorado’s gold-domed statehouse recently say that the oil and gas industry is increasingly behaving like the National Rifle Association. Like the NRA, which vigorously opposes any legislation restricting gun ownership, the oil and gas industry in Colorado steadfastly opposes new legislation it perceives would inconvenience its operators. Take, for example, the April 12 defeat in a Senate committee of a bill to measure mandatory 1,000-foot setbacks for new oil and gas facilities and wells from school property lines rather than school buildings. Even in these days of epic Republican vs. Democratic discord, the bill’s defeat on a party-line vote in a standing-room only Senate committee room left its supporters fuming. 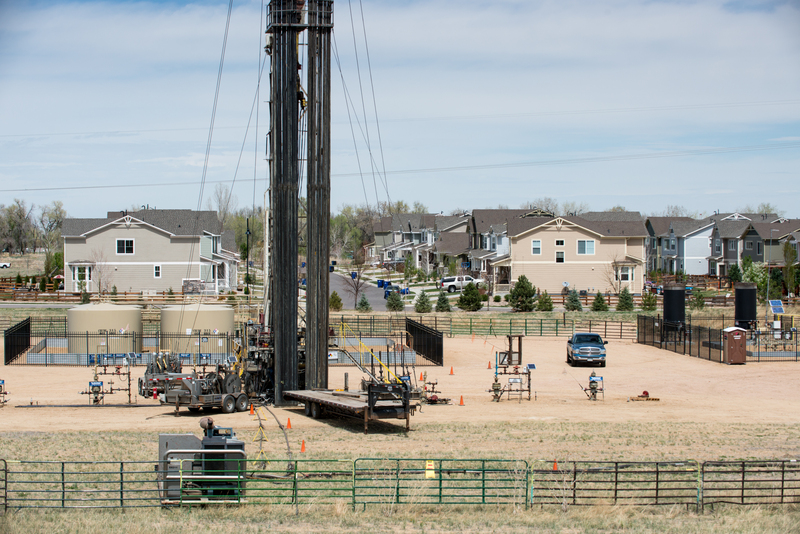 Colorado Oil and Gas Conservation Commission (COGCC) rules require new well pads and drilling rigs to be placed 1,000 feet from “high-occupancy buildings,” including school classrooms and cafeterias. But commission rules allow that same industrial infrastructure to be much closer to other school properties, such as playgrounds, playing fields, and temporary classrooms. 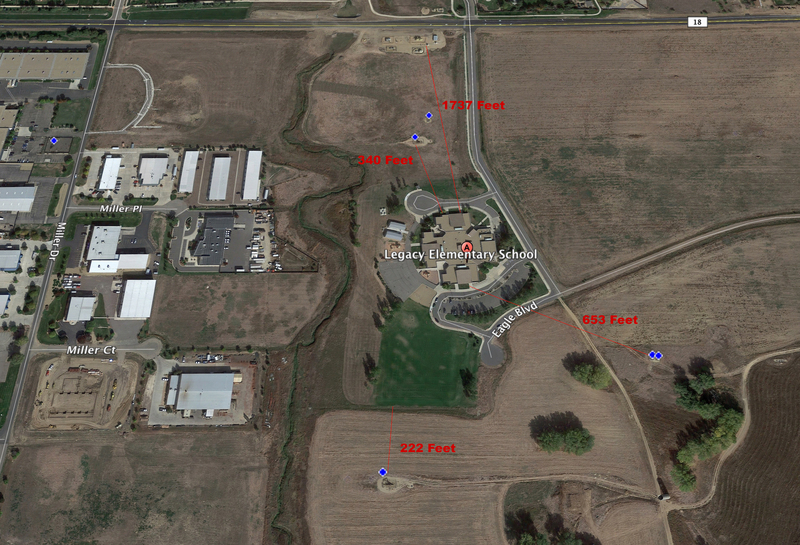 Proponents of the setback legislation unsuccessfully argued during the Senate committee hearing that liquor stores and marijuana dispensaries must be located at least 1,000 feet from the edge of school property lines, not just from school buildings. They noted that Colorado law limits how long diesel vehicles can idle near schools, because idling emits pollutants such as benzene and toluene, which are similar to those released by oil and gas operations. In an ironic coup de grace during the hearing, supporters of the setback reminded the committee that in 2011, legislators mandated that Colorado schoolchildren engage in 30 minutes of exercise per day. If the setback bill didn’t pass, advocates warned, then the same legislature would effectively require an undetermined number of children to play within a few hundred feet of active oil and gas wells that routinely leak toxic chemicals. Opponents of the school setback bill, including the Colorado Oil and Gas Association (COGA), the Colorado Petroleum Council (a branch of the American Petroleum Institute), and other industry representatives argued that current setbacks and regulations are sufficient to protect schoolchildren. Industry representatives say that it is extremely rare that companies apply for drilling permits close to schools in any case, and some of the examples that have been cited by bill proponents are instances where schools were built in proximity to existing wells, and not the other way around. 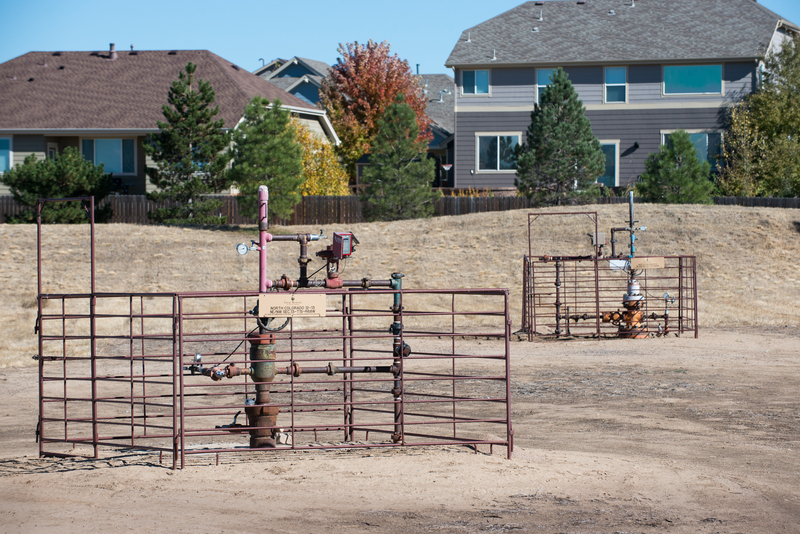 At least a dozen schools in the Greater Wattenberg field, mostly in Weld and Adams counties, are near wells, says Matt Samelson of Western Environmental Law Partners. He added that state records are imprecise about the distance from school buildings versus school property lines. It’s probably fairer to say that killing the bill was more about politics than it was about safety — on both sides of the hydrocarbon divide. After passing the Democrat-controlled House on a party line vote in late March, it was defeated in the Republican-majority Senate committee on a partisan 6-5 vote, burying the bill for this legislative session. Advocates for keeping oil and gas production as far away as possible from people and the places where they learn, work, and play say the industry has done a pretty good job of giving itself a black eye, with its no-holds-barred, money-fueled influence in state politics. The Colorado energy industry has been on a political spending binge over the past few years, since five Colorado cities passed local bans on new oil and gas development in 2012 and 2013 (and which were ultimately struck down by the state Supreme Court a year ago). According a 2014 report from Colorado Ethics Watch, that year saw a “titanic money spill” by the energy industry into election spending, increasing from $800,000 on state elections (not including U.S. Senate or Congressional elections) during the 2010 and 2012 election cycles to more than $11.79 million on the 2014 state election. Democrats as well as Republicans were recipients of that largesse, which may be one reason why even when Democrats controlled both chambers in the statehouse as well as the governorship, legislation to curb oil and gas development still didn’t flow freely. Industry money has also flowed into massive public relations efforts. Coloradans for Responsible Energy Development (CRED), largely funded by Anadarko Petroleum and Noble Energy, spent more than $10 million on “advertising and promotion” in 2014, according to CRED’s IRS 990 form that non-profit organizations must make public. The push coincided with several citizen-sponsored initiatives aimed at the oil and gas industry, including an effort to create larger buffer zones between occupied structures and oil wells. Initiatives 75 and 78 failed to receive enough signatures to qualify for the ballot after the industry spent millions of dollars on a “Decline to Sign” campaign. The industry also supported the so-called “Raise the Bar” initiative to make citizen-backed efforts to put issues on the ballot more difficult. Raise the Bar passed, but its constitutionality is now being challenged in federal court. Productive engagement is in short supply these days when it comes to relations between the industry’s Republican supporters in the statehouse and Democrats seeking reforms. The 2016 election flipped the state Senate into Republican control, which emboldened both the industry and its backers, says Will Toor, a member of the state Air Quality Control Commission and former member of the governor’s oil and gas task force. “The industry became very intractable after that,” he says. Even before the bill was debated at a House committee on April 19, however, it was stripped of a provision to require a majority of mineral owners in a “spacing unit” to agree to the lease after the bill’s sponsors had learned the resistance to that provision would be impossible to overcome. What remained was a requirement that companies that seek to force pool mineral owners must give 90 days notification to affected parties, rather than the current 35 days. As with the setback bill, a parade of homeowners and mineral owners appeared at the statehouse to plead their case for this change, and again, a parade of industry representatives predicted doom if the bill were to pass. Some political analysts thought the forced pooling bill might appeal to both sides of the aisle, since it was framed as a way to protect private property rights of mineral owners who might choose to sell at a later date, or to take time to negotiate better royalty payments. It would also appeal, proponents argued, to conservatives who were concerned about government overreach, since forced pooling represents an example of a government approval process that essentially gives precedence to a private company’s rights over citizen’s property rights. The forced pooling bill passed the House on April 26 but is headed for the Senate “kill committee,” so-named because its Republican members are in such safe seats that they are subject to less public pressure for what may be seen as controversial votes. The bill is expected to meet the same fate as the school setback bill on May 3. Both of these bills illuminate the way the industry refuses to cede even the slightest ground, even when facing down scolding mothers and images of exploding tanks near schoolyards. 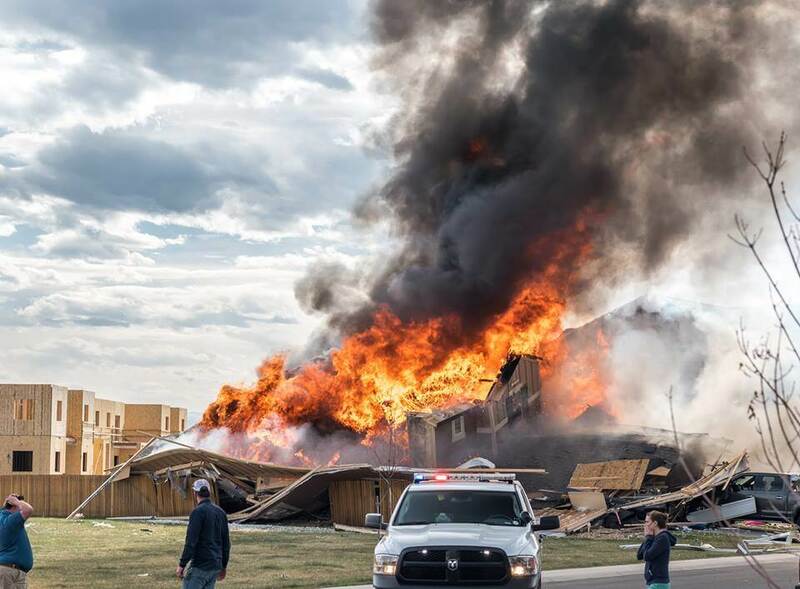 Firestone house explosion, April 17, 2017. Photo by Dennis Herrera. On the other side, industry representatives and lawyers predicted pain for the state’s economy, job growth, and way of life if any further restrictions were to be placed on their operations. They argued that the state increased the mandatory setback distance just a few years ago, and that the new regulations that resulted from Hickenlooper’s task force recommendations were already among the most stringent in the country. COGA President Haley told legislators that the industry is already well regulated, and that health and safety are not concerns. “The data show there are low risks,” he told the committee, and added in an emailed statement, “Recent health studies have shown that the current 1,000-foot setback, which was tripled in length just four years ago, is clearly a safe distance.” The Colorado Petroleum Council’s Bentley went further, attacking the “supposed scientists and researchers” who disagree with the assessment that there are no health impacts associated with oil and gas operations. Lisa McKenzie, a researcher at the Colorado School of Public Health on the University of Colorado Anschutz Medical Campus, whose own research has shown statistical links between living near oil and gas wells and certain increased health risks, also testified before the committee. McKenzie said there are several peer-reviewed studies, including her own, that link proximity to wells in Colorado to increased risk of varied health impacts, including higher cancer risks and birth defects. She also noted that science moves slowly, and that definitive information about the exact range of impacts at what precise distance from wells “will not be available for years.” What scientists do know with certainty, McKenzie told the legislators, is that “children are especially vulnerable” to exposures from toxic chemicals known to be emitted during the drilling and processing of hydrocarbons. The most accurate scientific statement that anybody can make at this point might be that nobody has proved exactly how much exposure that children can safely face, to which chemicals, at what precise distance, at what time of year, under what weather conditions, and for how long. Then there are the known facts. Pam Milmoe, the air quality coordinator for Boulder County Public Health, adds that besides the potential of future health impacts from toxic exposures, “we have a public health problem that oil and gas development is contributing to today.” Milmoe points to a series of studies that show that regional ozone levels, which are associated with a host of respiratory and other diseases, are clearly linked to emissions from oil and gas operations. “There is no uncertainty about that now,” she said. Scientists also know with certainty that nobody has systematically documented the quantity and composition of the chemicals that are being released into the atmosphere by oil and gas operations. What evidence there is in Colorado suggests that the amount of toxic chemicals released, such as the carcinogen benzene, has been underestimated. One week after the committee hearing, scientists from a variety of disciplines presented their findings in Boulder, focusing on air quality impacts and other potential by-products of oil and gas development. The scientists were not public health experts, but all agreed that the amount of toxic chemicals emitted during the course of drilling, pumping, separating, and transporting oil and gas is substantially greater than previous estimates. They also agreed that, due to a lack of funding to find out more by conducting more detailed studies, scientists may not know enough before it’s too late to prevent measurable health impacts. In other words: What we don’t know can still hurt us. “There are no studies saying it doesn’t cause any harm,” says Kevin Lynch, a law professor at Denver University’s Sturm Colllege of Law, who has been involved in several groundbreaking lawsuits that challenge the Colorado oil and gas industry’s interpretation of science and law. The statement that the industry had to move three times as far from schools after the Governor’s task force released its recommendations is technically true, but also leaves out an important point: Even since the task force convened, energy companies have substantially increased the scale of their operations near schools and homes. Attorney Sura, who was a member of the task force, told the committee that when the setbacks were increased, there “was no discussion of megasites,” such as new proposals to drill dozens of wells from a single pad within a home run’s distance of a high school running track, as is the case at Northridge High School in Greeley. 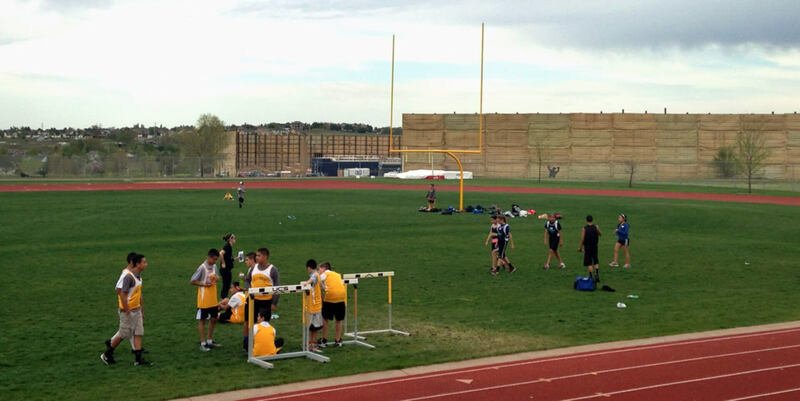 One such proposal involves a site near Bella Romero Academy in Weld County, where Extraction Oil and Gas, LLC successfully gained permission from the COGCC to put a 24-well site less than 500 feet from the edge of the middle school’s soccer fields. A lawsuit challenging the approval is pending. In an increasingly familiar set play of partisan political theater, most of the people who testified in favor of the school setback bill were residents who took time on a weekday afternoon to wait their turn to speak for three minutes in the standing-room only hearing room. “I don’t know anybody outside of the oil and gas industry who thinks that putting oil wells next to schools is a good idea,” said Ann Marie Byers, a Broomfield resident and mother of two who came to Denver to testify. Virtually all who opposed it were paid lobbyists, most from industry associations. This kind of representation at the statehouse is not unusual, nor is it unique to Colorado. As University of Colorado Denver Public Policy Professor Chris Weible and his colleague Tanya Heikkila wrote in understated academic language in the Review of Policy Research, “Industry actors constitute a large proportion of the proponent coalition and non-profits constitute a large proportion of the opponent coalition.” In an interview, Weible wondered what will happen if enough people feel like they are shut out of the political process. “If they’re not going to win in the legislature and with state regulators, they’ll be likely to go elsewhere,” he said. What is unique to Colorado is the growing confrontation between the state’s self-image as a clean, John Denver, Rocky Mountain High lifestyle sanctuary, and the collision between population growth and the oil and gas industry’s increasing reach across the state over the past 10 years. Most energy analysts believe oil prices will rise in the future, and the pressure to ramp up production will continue to press up against citizens’ concerns about the impacts of this development on their children, health, and property values. At the Senate hearing, more residents who supported the bill were lined up to testify when committee chair Sonnenberg called for the vote that killed it for this session. Additional photos by Hennis Herrera and Ted Wood. Video by Ted Wood/The Story Group.